The Graff family delivers smiles and goo dwill. LPD officers visit Menorah Hospital patient. LPD “No-Shave November” contest participants. ADMINISTRATION Chief	Troy	Rettig,	the	city’s	ninth	police	chief,	was	named	Chief	of	Police	in	September	of	2015. He	began	his	career	in	Leawood	in	1993. Chief	Rettig	oversees	a	staﬀ	that	is	divided	into	three	d i v i s i o n s :	A d m i n i s t r a t i v e	Services,	Support	Services	and	Operations. 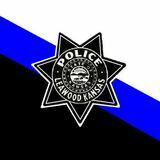 The	Leawood	Police	Department	has	an	authorized	strength	of	84	-	61	police	oﬃcers	and	23	civilian	personnel. In	2018	the	department	had	a	budget	of	$10.6	million. Deputy	Chief	Kevin	Cauley,	who	joined	the	department	in	1992,	is	t h e	C o m m a n d e r	o f	t h e	Administra=ve	Services	division. The	division	is	made	up	of	the	department ’s	many	civilian	employees,	who	provide	support	in	a	number	of	important	roles	including	the	Communica=on,	Records,	Animal	Control	and	Evidence	Units	as	well	as	the	Professional	Standards	Oﬃcer,	Police	Technology	Oﬃcer,	Public	Service	Oﬃcers,	and	the	Alarm	Coordinator. Support	Services	is	made	up	the	department’s	Inves=ga=ons	Unit,	Traﬃc	Management	Unit	and	DARE/SRO	Community	Educa=on	Unit. All	but	one	of	the	members	of	these	units	are	commissioned	oﬃcers	who,	aNer	several	years	on	Patrol,	were	selected	to	receive	specialized	training	and	transferred	to	ﬁll	a	posi=on	in	this	division. Capt. Dale	Finger,	who	joined	the	agency	in	2006	aNer	32	years	with	the	Kansas	Bureau	of	Inves=ga=ons,	is	the	division	commander. Easily	the	most	visible	of	the	department's	many	units,	the	members	of	the	Opera=ons	or	Patrol	Division	perform	much	of	the	publicly	visible	work	of	law	enforcement	in	the	City	of	Leawood. The	division's	patrol	oﬃcers	are	on	duty	24	hours	a	day,	7	days	a	week	spread	throughout	the	city	in	their	black	and	white	patrol	vehicles. Capt. Brad	Robbins,	who	was	ﬁrst	hired	i n	1 9 9 5 ,	i s	t h e	d i v i s i o n	commander. CALLS FOR SERVICE After	experiencing	nearly	a	44%	jump	in	calls	between	2013	and	2014,	the	volume	of	both	Admin	and	9-1-1	calls	received	by	the	Leawood	Police	Department	remained	relatively	ﬂat	the	last	ﬁve	years. In	2018,	Leawood	Communications	Specialists:	•	Handled	71,848	phone	calls,	a	decrease	of	3,9513	or	5.2%	from	a	year	ago. •Among	these,	9,477	of	the	calls	were	9-1-1	calls—	a	decrease	of	98	calls. Of	these	calls,	6,842	or	72.2%	were	wireless	calls. •	Handled	38	text	to	911	calls,	15	more	than	a	year	ago. •	Coordinated	24,675	events	on	the	radio;	11,731	of	which	were	dispatched	and	14,702	calls	that	were	initiated	by	oﬃcers. CRIME STATS PSA - carry your purse closed on your body when shopping. My purse was in my cart. I turned to get something out of the freezer section and felt someone brush against me. I turned and saw my purse open with my wallet missing. I saw the woman next to me with 2 other people walk away. I yelled, “Give me back my wallet.” She took it out of her scarf and dumped it in the produce. I grabbed it and started following her telling her to give me back anything she took. I snapped her pic, and kept following her while I dialed 911. A woman in the store tried to block her from leaving. She bolted, and that woman and a man followed them. While I was on the phone, I followed them too. She kept screaming at me that I was crazy. Then the man with her sped by me almost hitting the lady helping me and picked her up. They drove off. I was on the phone still & have the license plate #. The police were able to pick them up. Thankfully they only got a couple bucks because all my cards were still secured in my wallet. They police told me it is a ring that has been hitting grocery stores and then going directly to Target, Apple, and Walmart. He said I was the first person to catch them in the act and provide descriptions. I pressed charges, wrote my account, and went home without shopping as I was a bit shaken. Holy cow! CRASH STATS Crashes	can	and	do	take	place	anywhere	in	the	city,	from	parking	lots	to	the	Interstate. In	2018	Leawood	police	oďŹ&#x192;cers	investigated	723	crashes,	a	2.2%	decline	from	a	year	ago	but	still	well	above	the	six	year	low	of	663	in	2014. Of	these	crashes	104	or	about	1	in	7	resulted	in	injuries. Fortunately	however,	there	were	no	fatality	crashes	in	2018. Among	the	723	crashes	within	the	city,	76	(10.5%)	took	place	on	I-435	representing	a	drop	of	31.5%. Chief Troy Rettig (right) receives his five service stars recognizing his 25 years with Leawood Police Department. Officer Tim Mais is recognized as Leawood Police Department’s Top Gun. Sergeant Troy Osborn (left) receives his four service stars recognizing his 20 years with Leawood Police Department. Naomi	Kent,	center,	receives	the	Civilian	of	the	Year	Award	from	Deputy	Chief	Kevin	Cauley,	left,	and	Police	Chief	Troy	Rettig. The	police	department	celebrated	another	year	of	accomplishments	on	November	3rd	at	their	annual	awards	dinner. The	highlight	of	the	night	was	the	presentation	of	the	employee	of	the	year	awards	to	Jesse	Ryman	as	Oﬃcer	of	the	Year	and	Communications	Oﬃcer	Naomi	Kent	as	the	Civilian	of	the	Year. “I	was	ﬂattered,	humbled	and	felt	very	blessed	to	receive	the	award,”	Kent	said	afterward. “Leawood	PD	is	a	unique	atmosphere	that	provides	opportunities	to	serve	both	the	community	and	the	department	and	I	enjoy	being	part	of	such	a	terriﬁc	group	of	people. This	is	truly	an	honor	to	be	nominated	among	such	a	group	of	ﬁne	co-workers.”	Naomi,	who	joined	the	department	in	May	of	2013,	was	nominated	by	her	peers	for	the	compassion	and	caring	nature	she	brings	to	her	job. In	addition	to	her	dispatch	duties,	Naomi	continues	to	assist	with	car	safety	seat	appointments	and	this	year	was	integral	to	the	creation	of	the	department’s	peer	support	team. “She	has	been	a	very	active	part	of	the	peer	support	community	throughout	the	region	for	several	critical	incidents	aﬀecting	other	agencies	and	a	big	proponent	for	the	overall	mental	wellbeing	of	our	agency,”	one	nomination	said. Naomi	also	volunteered	to	assist	with	communications	for	the	Regional	Police	Academy’s	situational	exercises	and	outside	of	the	agency	she	serves	on	the	board	that	hosts	the	annual	Stair	Climb	to	remember	the	sacriﬁces	made	on	Sept.	11th. Jesse	Ryman,	right,	receives	the	Oﬃcer	of	the	Year	Award	from	Deputy	Chief	Kevin	Cauley,	left,	and	Police	Chief	Troy	Rettig. Jesse	was	named	the	department’s	Oﬃcer	of	the	Year	after	a	year	in	which	he	was	part	of	many	of	the	department’s	important	calls. Together	with	Oﬃcer	Matt	Schroeder,	Jesse	performed	CPR	on	a	fallen	jogger	who	eventually	regained	a	heartbeat	and	later	visited	the	oﬃcers	and	ﬁre	ﬁghters	to	thank	them. He	was	at	the	scene	when	shots	were	ﬁred	during	a	graduation	ceremony	at	Church	of	the	Resurrection	and	on	another	day	helped	capture	an	active	auto	burglar	in	the	same	parking	lot. He	also	made	the	most	traﬃc	stops	in	the	department	last	year	(2529	tickets	and	warnings	combined). “Jesse	does	his	job	so	well,	citizens	call	in	and	write	to	the	department	about	how	Oﬃcer	Ryman	gave	them	a	ticket	and	how	much	they	appreciated	getting	a	ticket	from	him,”	wrote	one	supervisor	in	nominating	Jesse	for	the	award. “I	was	completely	shocked	and	proud	when	I	was	named	Oﬃcer	of	Year,”	Ryman	said	later. “I	was	glad	my	family	was	there	to	share	the	moment.”	Ryman	ﬁrst	joined	the	department	in	2006	and	served	for	seven	years	before	exploring	an	opportunity	in	the	private	sector	in	2013. Two	years	later,	Ryman	returned	to	the	agency	and	in	2017	he	was	chosen	to	attend	Wheel	School	and	is	now	one	of	the	agency’s	two	motorcycle	oﬃcers. Sergeant	Ken	Whiteside	was	chosen	as	the	Kansas	CIT	Oﬃcer	of	the	Year	by	the	Kansas	chapter	of	the	National	Alliance	of	Mental	Illness. The	award	was	presented	at	the	organization’s	state	meeting	in	October. K e n	w a s	r e c o g n i z e d	f o r	h i s	leadership	in	the	development	and	training	of	CIT	(Crisis	Intervention	Team)	training,	his	service	to	the	Kansas	Law	Enforcement	CIT	Council	Sergeant Ken Whiteside serving	Johnson	County	and	his	role	in	starting	and	serving	as	the	ﬁrst	p r e s i d e n t	o f	t h e	K a n s a s	C I T	Safe	City	Awards	Association. In	2018,	Leawood	was	named	second	Safest	City	in	Kansas	by	Safe	-	the	CIT	is	a	national	training	model	for	National	Council	for	Home	Safety	and	Security	2018;	the	third	safest	city	in	oﬃcers	responding	to	calls	involving	Kansas	by	SAFEHOME	and	eighth	on	the	Safewise.com’s	list	of	the	top	20	citizens	with	mental	illness	that	was	safest	cities	in	Kansas. ﬁrst	developed	in	Memphis,	TN,	in	1988. The	Kansas	Law	Enforcement	Crisis	Intervention	Council	was	formed	in	2004	as	a	partnership	between	law	enforcement,	the	mental	health	system,	courts,	the	mentally	ill	and	their	families	with	the	g o a l	o f	r e d u c i n g	d a n g e r o u s	confrontations	and	reducing	criminal	recidivism. For	the	ﬁfth	consecutive	year,	the	City	of	Leawood	was	proud	to	earn	the	AAA	Platinum	Award	for	Community	Traﬃc	Safety. In	honor	of	the	ﬁfth	award,	this	year’s	plaque	featured	a	diamond	symbol	as	well. The	award	is	presented	annually	after	a	review	of	the	pedestrian	and	traﬃc	safety	initiatives	conducted,	safety	improvements	made	and	any	educational	programs	taught	during	the	year. Among	the	department’s	initiatives	was	participating	in	the	state-wide	SAFE	program	to	promote	greater	seat	belt	use	by	school	aged	children	and	hosting	a	child	passenger	safety	certiﬁcation	course,	during	which	the	participants	checked	more	than	200	child	safety	seats. Working	with	other	city	departments,	nearly	1000	sidewalk	trip	hazards	were	identiﬁed	and	repaired. A	promotion	ceremony	was	held	June	11th	after	the	June	8th	retirement	of	Sgt. Mark	Hackathorn. Cpl. Ken	Whiteside	(top	center)	,	who	joined	the	department	in	1994,	was	promoted	to	Sergeant	and	Paul	Day	(bottom	right),	who	started	in	2006,	was	promoted	to	Corporal. Ken’s	wife	Ahvy	pinned	on	her	husband’s	new	badge	(left)	while	Paul’s	wife	Ellen,	a	Shawnee	detective	and	former	Leawood	oﬃcer,	pinned	on	his	badge. Both	will	be	in	the	Patrol	Division. 2018 DEPARTMENT HIGHLIGHTS Personnel	Moves:	•Hired	9	police	oﬃcers	and	1	communications	oﬃcer. September	the	annual	citizen’s	police	academy,	a	feature	of	the	police	department	since	1993,	began	with	a	record	33	participants	who	are	all	residents. the	Resurrection. Eight	oﬀ	duty	oﬃcers	were	on	scene	as	this	occurred	and	all	did	an	outstanding	job	in	a	chaotic	scene. After	an	extended	investigation	we	were	able	to	charge	the	two	primary	oﬀenders. garage	door	burglaries	in	an	unprecedented	frequency	in	the	metro	area	and	Leawood. We	were	able	to	charge	multiple	suspects	and	our	persistence	in	patrolling	our	City	streets	during	the	overnights	helped	with	fewer	break-ins	than	neighboring	cities. In	our	eﬀorts	to	reduce	the	number	of	incidents	in	the	city	we	prioritized	notifying	our	residents	that	their	garage	doors	were	open	at	night. Our	oﬃcers	contacted	residents	about	532	open	garage	doors	between	the	dates	of	June	1	and	August	31st. • A	reduction	in	both	injury	and	non-injury	crashes	in	2018	from	2017. (21%)	we	had	a	similarly	signiﬁcant	reduction	in	reported	violent	crimes	(22%). Unity	Tour. Retired	Sergeant	Tim	Anderson	,	Corporal	Erik	Butler	and	Sergeant	Kirt	Yoder	joined	over	2500	LEOs	and	survivors	in	bicycling	over	230	miles	into	the	National	Law	Enforcement	Oﬃcers	Memorial	in	Washington	DC	in	remembrance	of	oﬃcers	killed	in	the	line	of	duty. Each	member	of	Team	Leawood	raised	over	$2000	for	the	event. Fifteen	years	after	he	made	his	ﬁrst	appearance,	Copper,	the	police	department’s	mascot,	got	a	facelift	in	October. Oﬃcer	Curtis	Rice,	the	third	person	to	give	life	to	our	mascot,	spearheaded	an	eﬀort	to	update	Copper’s	‘uniform’,	replacing	the	former	blue	over	gray	color	scheme	with	the	same	solid	blue	uniform	and	patches	that	oﬃcers	now	wear	on	patrol. April	is	a	busy	month	for	the	city’s	three	DARE	oﬃcers	as	they	wrap	up	their	lessons	on	drug	&	alcohol	abuse	and	bullying	prevention. Last	month	153	students	were	honored	in	graduation	ceremonies	at	their	schools:	St.	Michaels	had	71	graduates;	Brookwood	had	48	and	Nativity	had	34. Corinth	and	Cure	of	Ars	also	have	DARE	programs,	but	their	graduations	are	scheduled	in	other	months. Leawood	DARE	oﬃcers	also	visit	Leawood,	Mission	Trail	and	Prairie	Star	Elementary	Schools,	but	they	don’t	teach	the	full	DARE	program	in	these	schools. Click HERE Take the Leawood Police Citizen Survey T h e	m i s s i o n	o f	t h e	L e a w o o d	P o l i c e	Department	is	to	protect	the	community	while	setting	the	standard	for	service	to	ensure	a	peaceful	quality	of	life. In	order	to	better	determine	whether	we	are	in	fact	accomplishing	our	mission,	the	Leawood	Police	Department	welcomes	input	from	the	community	we	serve. This	survey	will	help	us	to	ensure	that	we	maintain	the	level	of	service	that	our	public	expect	and	deserve. Your	identity	will	remain	anonymous	with	only	your	answers	being	returned	to	the	department. If	you	would	like	to	be	contacted,	you	may	leave	your	e-mail	or	phone	number	on	the	last	page. The	search	for	police	oﬃcers	began	with	148	applicants	taking	the	initial	written	test. From	this	group,	60	people	chose	to	return	for	oral	interviews	in	front	of	a	board	of	oﬃcers. The	ﬁeld	was	further	narrowed	to	16	oﬃcers	who	were	interviewed	by	the	Chief	Troy	Rettig	and	entered	the	background	phase. In	addition	to	backgrounds,	testing	for	all	applicants	who	receive	a	job	oﬀer	includes	a	physical	exam	and	drug	screen. Several	positions	also	take	polygraph	examinations	and	go	through	a	mental	health	screening. Police	Oﬃcers	will	also	need	to	complete	a	physical	agility	test. Eventually	the	majority	of	our	new	oﬃcers	were	hired	and	needed	to	attend	the	16-week	basic	training	at	the	Johnson	County	Regional	Police	Academy. Once	they	graduated,	the	new	graduates	–	and	those	that	made	a	lateral	move	to	Leawood	with	prior	law	enforcement	experience	-	transitioned	to	a	16-week	on-the-job	ﬁeld	training	program,	riding	with	a	veteran	oﬃcer	to	‘teach	them	the	ropes’	before	they	graduated	to	work	on	their	own. Similarly,	our	Communications	Oﬃcer	candidates	complete	a	multi-week	training	program	to	develop	all	of	the	skills	they’ll	need. Throughout	the	processes,	new	employees	are	given	feedback	and	assistance	by	their	co-workers. As	every	new	hire	hears,	we	are	in	this	together	and	everyone	is	willing	to	assist	to	help	make	the	team	better. It’s	our	investment	in	the	future	of	our	agency. Leawood City Clerk Deb Harper (left) Swearing in (from left) Cody Morse, John McLaughlin Jr. and David Chatelain. RETIREMENTS 108	Years	of	Experience	Lost 108	Years	of	Experience	Lost The	police	department	experienced	the	loss	of	more	than	108	years	of	experience	with	the	retirements	of	Oﬃcer	Mike	Pelger	(30	years	of	service),	Sergeant	Mark	Hackathorn	(27	years),	Communications	Oﬃcer	Tonja	Standifer-Barron	(20	years)	and	Detective	Bill	Burke	(31	years	of	service)	in	2018. Mike	Pelger	joined	the	Leawood	Police	Department	in	1988	after	two	years	with	the	Atchison,	KS,	Police	Department. During	his	career	Mike	served	in	Patrol	and	a	DARE	oﬃcer	before	becoming	the	department’s	ﬁrst	technology	oﬃcer,	working	to	train	employees	on	the	department’s	computerized	record	management	system	and	introducing	digital	body	cameras	and	digital	ticketing	technology. He	was	recognized	as	the	department’s	Oﬃcer	of	the	Year	in	2011	and	the	City	of	Leawood’s	Employee	of	the	Year	in	2017. Mark	Hackathorn	applied	to	the	police	department	in	1991	after	several	years	as	a	teacher. During	his	career	in	Leawood	he	served	in	the	Patrol	unit	as	a	Field	Training	Oﬃcer	and	Evidence	Technician	before	promoting	into	the	supervisory	ranks. He	served	two	stints	as	the	supervisor	of	the	Traﬃc	Management	Unit,	introducing	laser	speed	detection	and	speed	measuring	trailers. He	was	also	a	founding	members	of	the	Honor	Guard	team. Tonja	Standifer-Barron	applied	to	the	Leawood	Police	Department	after	moving	to	the	Midwest	from	the	Los	Angeles	area,	where	she	had	worked	in	parking	enforcement	among	other	positions. She	spent	20	years	serving	as	the	conduit	between	the	public	and	our	oﬃcers,	eventually	becoming	a	training	oﬃcer	for	new	dispatchers. Bill	Burke	joined	the	department	in	1987. He	worked	in	Patrol	and	the	Traﬃc	Management	Unit,	where	he	became	one	of	the	city’s	ﬁrst	Drug	Recognition	Experts,	specially	trained	to	detect	driver’s	impaired	by	drugs. Bill	moved	to	the	Investigations	Unit	in	1999	and	served	with	a	US	Postal	Inspectors	Service	Task	Force. In	2016	he	was	named	the	department’s	Oﬃcer	of	the	Year. In	addition	to	his	service	to	Leawood,	Bill	was	also	an	Army	Reservist	who	deployed	overseas	three	times	in	nearly	20	years	of	service. LPD’s Honor Guard at the K (from left) Sergeant Ken Whiteside, Officers Ben Slenker, Robert Mahon, Joe Peeples. 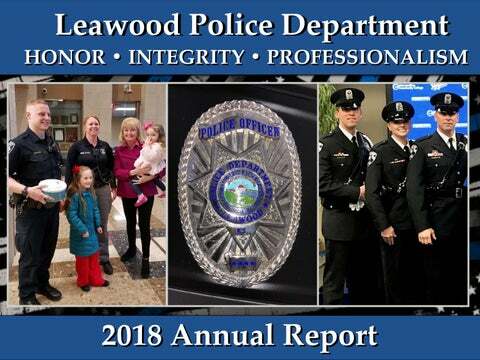 This is the 2018 annual report for the Leawood (KS) Police Department.